A self-driving delivery van could be ferrying packages on European roads in the near future. Automotive supplier ZF Friedrichshafen will build the so-called Innovation Van, which also will be fully electric, the company’s chief executive, Wolf-Henning Scheider, said Wednesday at the 2018 IAA Commercial Vehicles show in Hanover, Germany. The van is intended to serve the last-mile delivery segment that brings packages from a distribution center to customers’ front door. It’s capable of Level 4 autonomous driving, meaning it operates itself unless control is taken over by an on-board driver. The van can steer itself around obstacles, stop in emergencies, identify parking and will trail a delivery person on foot. 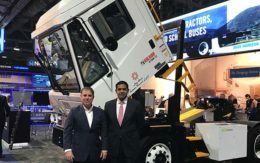 “We are revolutionizing the ‘last mile’ so that packages can be delivered more cleanly, safely and on time,” Scheider said. ZF is “in concrete negotiations with several customers” for a production version of the Innovation Van, he said. The company expects production on the Innovation Van to begin in 2020. The van uses an assortment of ZF technologies the company is developing to feed future demand for electric and autonomous vehicles. It is equipped with electric axles, steering and braking systems all developed in house. Its radar, cameras, sensors and Lidar systems are made by Ibeo Automotive Systems, in which ZF owns a 40 percent stake. 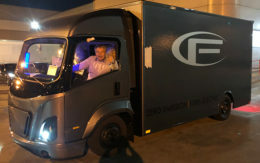 The brain of the vehicle is ZF’s ProAI 2.0, an upgraded version of the ProAI supercomputer showcased at the Consumer Electronics Show in Las Vegas this year. ProAI runs on a computing platform from tech giant Nvidia. The upcoming ProAI 2.0 will add Nvidia’s powerful Xavier processing chip. ZF will make ProAI 2.0 by the end of 2019. ZF presented a working concept of the Innovation Van in June during its Technology Day at company headquarters in Friedrichshafen, Germany. The prototype consisted of a modified Fiat Ducato with electric and autonomous components. The vehicle took ZF nine months to develop. On an arranged city course, the van read and reacted to traffic signs on its own. It carted two delivery workers along their route, dropping and retrieving them autonomously when summoned. Customers asked for a vehicle that can drive itself to free time for employees to manage related responsibilities, Scheider said. “If you have more time for the operator to take care of other logistics tasks — like dispatching or organizing the load — that is immediately a business case for our clients,” he said. The project faces obstacles. Level 4 automated vehicles are not allowed to drive autonomously on public roads in Europe. New legislation is needed before the Innovation Van can be used for everyday deliveries. Discussions are underway to introduce new legislation that would allow Level 4 vehicles to operate on public roads, Scheider said. In the meantime, ZF will limit its automated vehicles to restricted areas and explore testing in countries with fewer restrictions. ZF also is working to reduce the price of its technology so customers can quickly recoup extra up-front costs. The target for a full return on investment is within one to two years. To achieve that goal, the technology and physical components in the Innovation Van are modular. 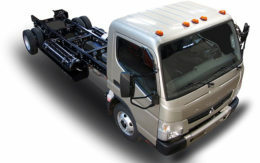 That means they can be applied to other commercial vehicles in the company’s lineup. “There is no commercial vehicle class that’s not going to be equipped for electric drive by ZF in the next few years,” Scheider said.